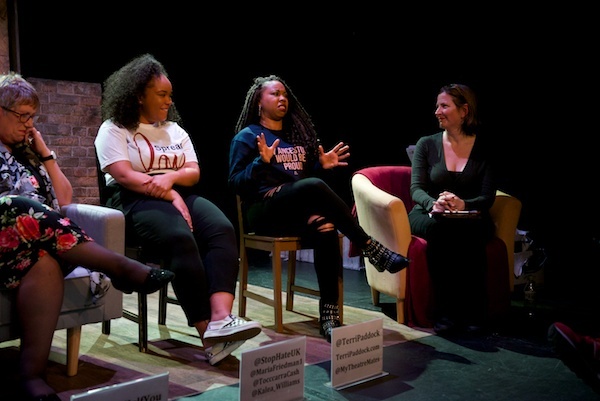 At a recent post-show panel I hosted at The Father on the subject of “Women in the Arts”, Act for Change campaigner Stephanie Street shared a statistic that shocked me: currently, according to Stephanie, the average ratio of male to female roles in the West End is 10-1. Could that really be true? Just ten percent are women?! 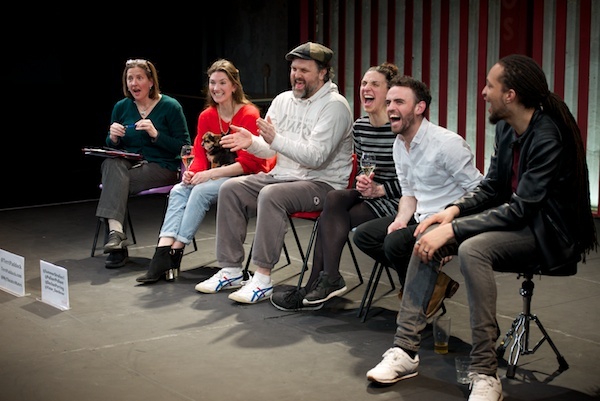 Fellow panelist, and editor of The Stage, Alistair Smith nodded as if he could believe it and went on to explain his simple curtain call test: every time he sees a show, he does a quick mental tally when the actors take their bow. So, I’ve decided to document my own curtain call testing from henceforth, and not just in my head. The theatregoing diversity numbers are all going into a spreadsheet, and I’ll share full analysis at the end of the year. I attend more Off-West End than West End productions these days: will this help creative a more positive statistic? We’ll see. In the meantime, I’ll include show-by-show gender and ethnic diversity tallies in these theatre diary round-ups. As usual, I’ve listed productions in closing date order. 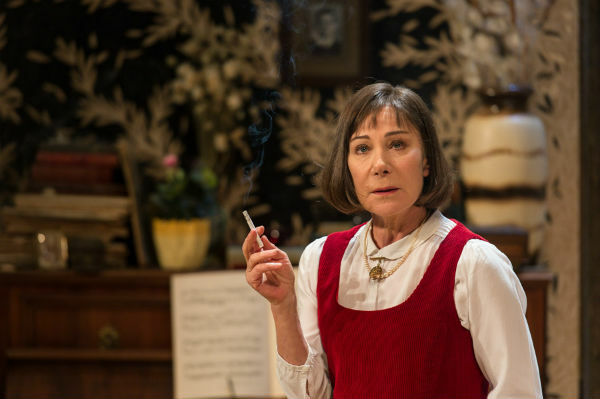 Note, seriously don’t delay if you want to see Zoe Wanamaker in Stevie as it finishes its run at Hampstead Theatre this Saturday. “A good time was had by all,” is a wonderful phrase, isn’t it? One of those phrases that’s become part of our social linguistic fabric. So next time you use “a good time”, give mental thanks to Stevie Smith, the poet who coined the phrase. Or better yet, in preparation for all those future thanks you’re going to give, rush down to Hampstead Theatre and see Hugh Whitemore‘s eponymous play about its author before it closes on Saturday night. Does Zoe Wanamaker age? 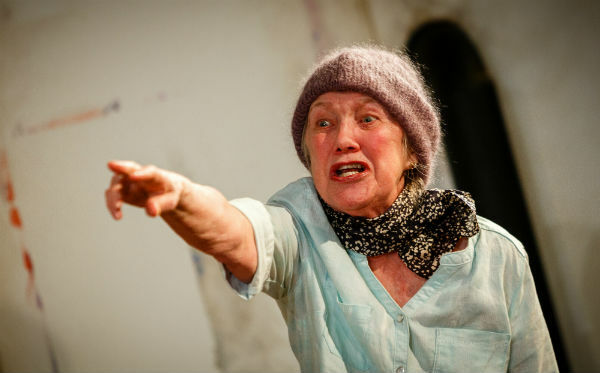 She’s effervescent as woman-child Stevie, a wonderfully eccentric and lovable character who spurns love (or at least romantic love) to stay in her north London family home with her elderly aunt, eke out poems, fight off suicidal thoughts and become (in the 1960s) mildly famous. Between scenes of daily life, there are snatches of wry poetry and insights into the creative process, both of which leave you wanting more and still more of the Smith wit. Lynda Baron is the lionised aunt and Chris Larkin a variety of male acquaintances. Christopher Morahan directs. Stevie finishes its limited season at Hampstead Theatre on 18 April 2015. Tom Davey, Sean Brown and Dugald Bruce-Lockhart in Three Lions at St James Theatre, London, 2015. The St James Theatre is becoming my go-to venue for smart comedies. After Torben Betts’ Invincible and Joshua Harmon’s Bad Jews, now transferred to the West End’s Arts Theatre, we have actor-turned-playwright William Gaminara‘s The Three Lions. I hear that, like Bad Jews and Gaminara himself (currently performing in the RSC’s Oppenheimer), these Lions may be roaming in the West End after they finish at the St James. Let’s hope so. A footballer, a prince and a prime minister walk into a hotel room… A real-life diplomatic situation that already sounds like a farce, and that’s exactly what we get as Gaminara takes us behind the scenes in Zurich when David Beckham, Prince William and David Cameron failed in England’s bid to bring the World Cup home in 2018. 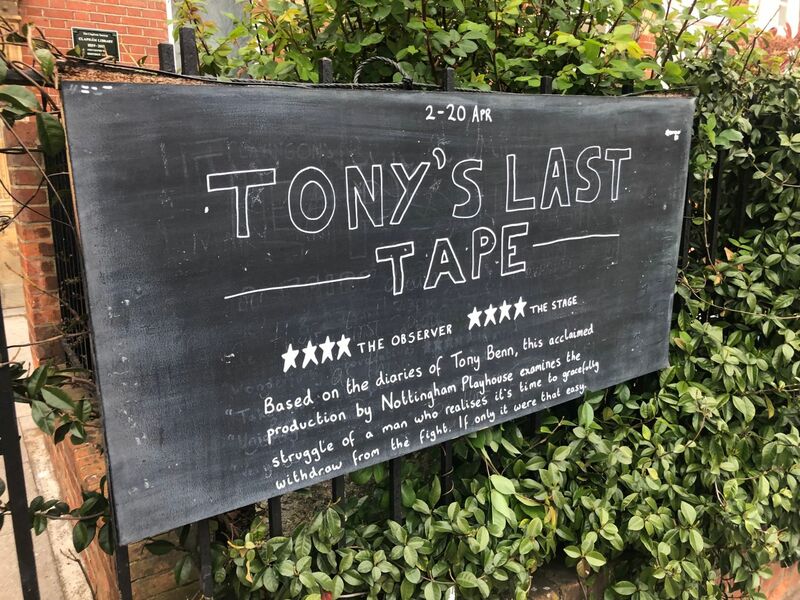 Philip Wilson‘s zippy production is blessed with three actors who, though not doppelgangers, are adept at capturing the telltale mannerisms and expressions of the very public figures that they play. Sean Browne seems to embody the essence of Beckham with his eyebrows alone and a dumbfounded sweetness, while Tom Davey and Dugald Bruce-Lockhart are less charming but no less amusing as fellow Old Etonians, HRH and Cameron. 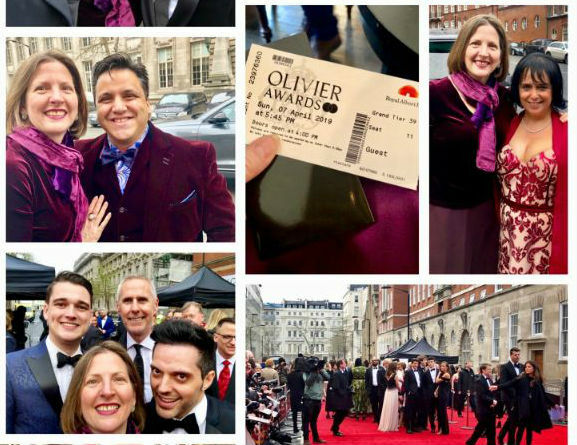 Antonia Kinlay as a starstruck aide, Lewis Collier as an Aussie interloper and Ravi Ajula as a sycophantic waiter help raise the farce factor and there’s a tabloidy twist in the tail. 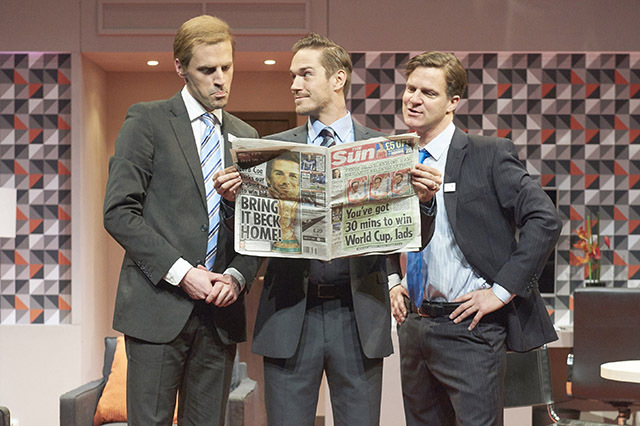 The Three Lions runs at the St James Theatre until 2 May 2015. 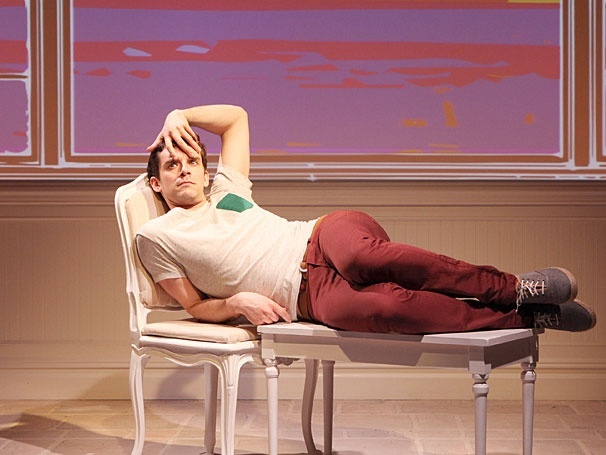 Michael Urie reprises his New York performance in Buyer & Cellar at the Menier Chocolate Factory, London, 2015. You don’t have to be a massive Barbra Streisand aficionado to enjoy Buyer & Cellar – though you’re likely to enjoy it much more if you do. Ditto if you’re an actor who knows just what level of indignity you’ll to sink to when you’re “resting” and/or if you’re a gay men who embraces your inner and outer campness. And/or one last ditto: if you’re an Ugly Betty fan. Michael Urie (a.k.a. Marc St James from American sitcom Ugly Betty) reprises his award-winning New York performance for this UK premiere of Jonathan Tolins’ one-man play. Though the story is fictional, it’s inspired by the reality that, as detailed in her style guide My Passion for Design, Streisand has installed her own private, subterranean shopping mall beneath her Los Angeles mansion. A bitingly funny portrait of materialism and celebrity gone mad. Buyer & Cellar runs at the Menier Chocolate Factory until 2 May 2015. 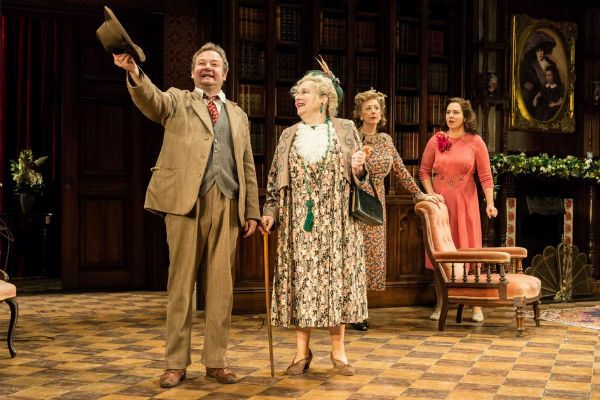 James Dreyfus, Amanda Boxer, Maureen Lipman and Ingrid Oliver in Harvey at the Theatre Royal Haymarket, London, 2015. The day before I headed to the Haymarket, I read a stinking two-star review for this production. But don’t let that put you off. My friend and I were glad we didn’t. Also, don’t be fooled into thinking this is “just another” screen-to-stage adaptation. The 1950 film, starring Jimmy Stewart, was based on this 1944 film by Mary Chase, who wrote it in an attempt to cheer up a friend whose husband had been killed in the Second World War. I’m not sure if it did the friend much good, but Harvey did wonders for Chase: making her name and her fortune and winning her a Pulitzer Prize. Seventy years on, some of the humour in this small-town story of Elwood P Dowd and his devotion to his best friend Harvey, an invisible six-foot rabbit, is undoubtedly creaky. But director Lindsay Posner, rightly, doesn’t try to modishly modernise it. This is a handsomely solid production of a period piece that harks back to a more innocent age. If there is an overriding message for our frenzied modern age, it is a simple but important one: slow down and be kind. That’s a message I can subscribe to. James Dreyfus plays against type as the genial Elwood and Maureen Lipman steals the show as his fretful sister who is torn between her yearning for respectability and her love for her brother. Harvey runs at the West End’s Theatre Royal Haymarket until 2 May 2015. Marty Cruickshank in After Electra at the Tricycle Theatre, London, 2015. 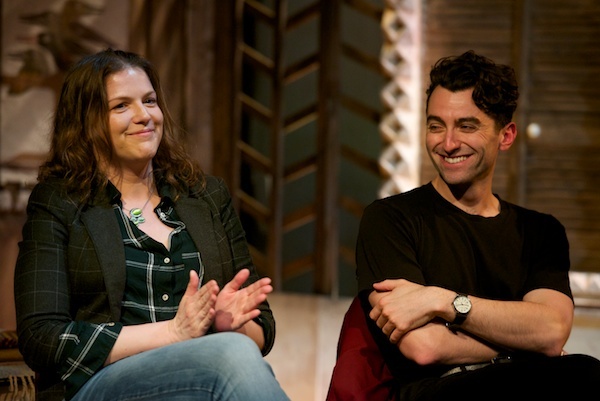 In light of the statistics revealed at my gender equity panel discussion, and Act for Change‘s current “Women of a Certain Age” campaign, April de Angelis‘ new play, loosely inspired by Sophocles, is cause for hope. Not only is it written by a woman, it has five strong, modern roles for women, four of them for women over fifty. Said cast members seem to embrace the opportunity. Marty Cruickshank leads as Virgie, an octogenarian painter who invites her friends and family to her birthday-suicide party; Rachel Bell is her younger sister, a former headmistress now in the House of Lords; Kate Fahy is the novelist wife of a philandering actor; and Veronica Roberts is Virgie’s fifty-something daughter, still recovering from her bohemian upbringing. De Angelis doesn’t paint creative types in a very flattering light, but she nonetheless questions society’s right to judge their choices, especially about mothering, no matter how seemingly selfish. Samuel West directs the production which premiered at and was commissioned by Theatre Royal Plymouth. After Electra runs at the Tricycle Theatre until 2 May 2015.